M&M Meat Shops Val Caron Flyer & Hours. M&M Meat Shops 3030 Highway 69 North, Val Caron, P3N 1R8, Ontario store opening hours, weekly flyer, best deals & specials, Boxing Day Sales, location, phone number. Special Store Hours: Boxing Day, Black Friday, Cyber Monday, Good Friday, New Year’s Day, Canaday Day, Labour Day, Christmas Day, Easter Monday, Victoria Day, Thanksgiving Day, Remembrance Day, Family Day or Civic Holiday. M&M Meat Shops was founded with the vision of bringing Canadians restaurant-quality food that they could enjoy at home, at reasonable prices. 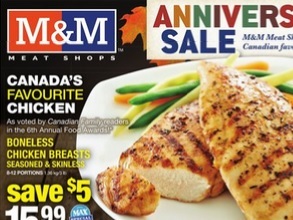 Today, M&M Meat Shops has grown to become Canada’s leading retailer of fine frozen foods. The retailer also sells: appetizers, seafood, vegetables, sides, bakery, sauces.